Changing a furnace filter can be confusing. You may have heard conflicting advice over the years from relatives, friends, or previous HVAC technicians. To change a furnace filter is to keep your whole system operating smoothly. It’s one of the most important and most overlooked parts of your HVAC system. Let’s learn more about furnace filters and why they’re important. Contact us today for service! The short answer: change a furnace filter every 30 days. This is the best way to ensure your filter stays clean and everything keeps running smoothly. Why Should I Change A Furnace Filter Every 30 Days? According to the United States Department of Energy, an average of 56% of your home’s energy usage comes from heating and cooling. This varies depending on the season, as well as the efficiency of the system. But airflow problems can reduce your system’s efficiency by up to 15%. This means you could see significant cost-savings by increasing efficiency. One of the best ways to increase efficiency is to ensure you’re furnace filter is clean, allowing air to flow freely without having to force its way through a few months of gunk. This also reduces wear-and-tear on your HVAC system, extending the life of your equipment and reducing costs there. We’ve already given you the word on the money you could save by choosing to change a furnace filter every 30 days. But money isn’t everything! Here are additional benefits. Do you know we Americans spend 90% of their time indoors, 69% of that time in our own homes? The Environmental Protection Agency (EPA) has done the studies, which also reveal that 97% of homes have indoor air quality issues. By replacing your furnace filter frequently, you’re protecting your family’s lungs and health for the 69% of the time they spend in your home. 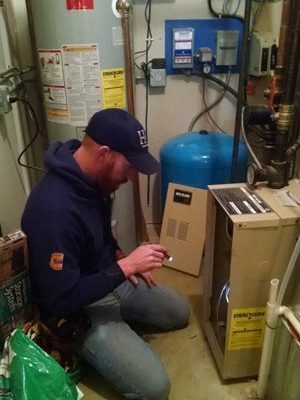 If you need help saving money and keeping your home safe, contact the furnace experts at H&S!